Aerial Imagery Solutions. ADVI/Thermal Imagery. Who Should Use Aerial Imagery Solutions. Imagery is the perfect complement to traditional field-based scouting services. Farmers who scout their own fields will benefit from the added knowledge and perspective advanced aerial imaging can offer. Partners, such as seed companies, scouting services, and other retailers who help farmers ensure maximum efficiency, will find AirScout an indispensable value-add, and competitive differentiator. How Aerial Imagery Solutions Works. Aerial Imagery Solutions augments ground scouting services by providing ongoing aerial photography approximately every two weeks throughout the growing season. We provide both visual and thermal images which are normally delivered to the farmer within 24 hours of acquisition. Our process uses state-of-the-art thermal technology that is far more precise and sophisticated than earlier infrared or NDVI methodologies. This photography can reveal temperature changes which, in plants as in humans, can be indicative of illness and disease. 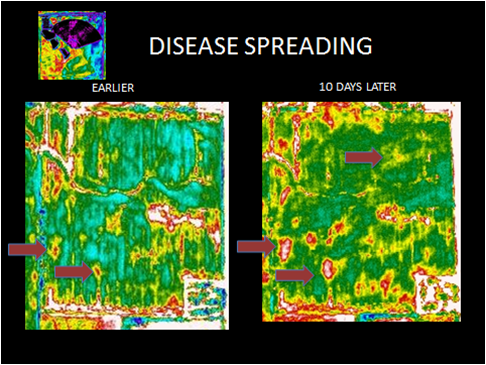 When used in conjunction with ground scouting, this service can help spot, analyze, and target treatments more effectively, without waste, and before plant health and productivity are compromised. Particularly in larger operations where scouting a significant portion of the fields is not always feasible, disease pressure can create crop demise and significant financial impact. By leveraging this technology, you can be more aware and proactive, and therefore, protect your investment and your income. A: Our business model is based on what we feel is important to farmers. Delivering a product that can be used by anyone, at an affordable price, in a very timely manner. To do this, all the “fluff” is eliminated. Many people ask why we don’t clip the pictures to match the field boundaries. The answer is simple. Clipping boundaries would only increase the price, and at the same time give you less. Many times disease will be creeping into your field from the neighbor’s field. Keeping an eye on areas outside your field boundaries is a good idea. A: Orthorectification is the process of removing the effects of image perspective (tilt) and relief (terrain) effects for the purpose of creating a planimetrically correct image. The resultant orthorectified image has a constant scale wherein features are represented in their “true” positions. This allows for the accurate direct measurement of distances, angles and areas. Q: Are your pictures orthorectified? A: The pictures you get are nearly raw from the camera. They are geotagged to tell where the picture was taken, and oriented in a “north up” fashion. From there, you can easily use our app to finish the alignment and go scouting. Because the world is round, computer screens are flat and camera lenses are concave, there may be some distortion in the edges of pictures. Although we could eliminate this, it would simply add tremendous cost and significantly delay the delivery of our pictures. Since you can easily adjust the alignment inside our app to correct for this, we did not think it would benefit our farmers much. A: The bottom line is that you are seeing very minor differences in temperature. Ideally, your field would look all the same color, and you would think our camera was broken. However, most fields will show quite a bit of variance. It is then your job to walk your field(s) and determine why one part of the field is hotter or cooler than the other. We will never pretend to be able to make that determination from our office. As always, remember this is a guide for crop scouting, NOT a replacement. Get out and scout. To learn more, visit the Demo Maps page.